As I mentioned in my previous post about this quilt, working on putting together a quilt that is set on point sometimes yields some goofy quilt pictures! I am almost at the halfway point where the quilt is a single gigantic triangle. Since I don't have a design wall, I typically use my carpets as my "design spaces". 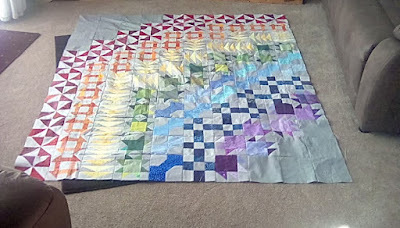 And since I have been working on this quilt on and off over the last month or so, I have been laying down the finished corner, laying out a row or two, sewing those rows together and then to the quilt top, and then strategically folding everything up. The row that I've been working on is the middle row of the quilt. It's ready to be added to the quilt (after a good press!). Happy Friday! I have a giveaway for Island Batik scraps going until Monday and we have a pattern sale in our Etsy shop! Summer Clean-Out Island Batik Giveaway! Update: the giveaway is now closed and the winners are noted below! 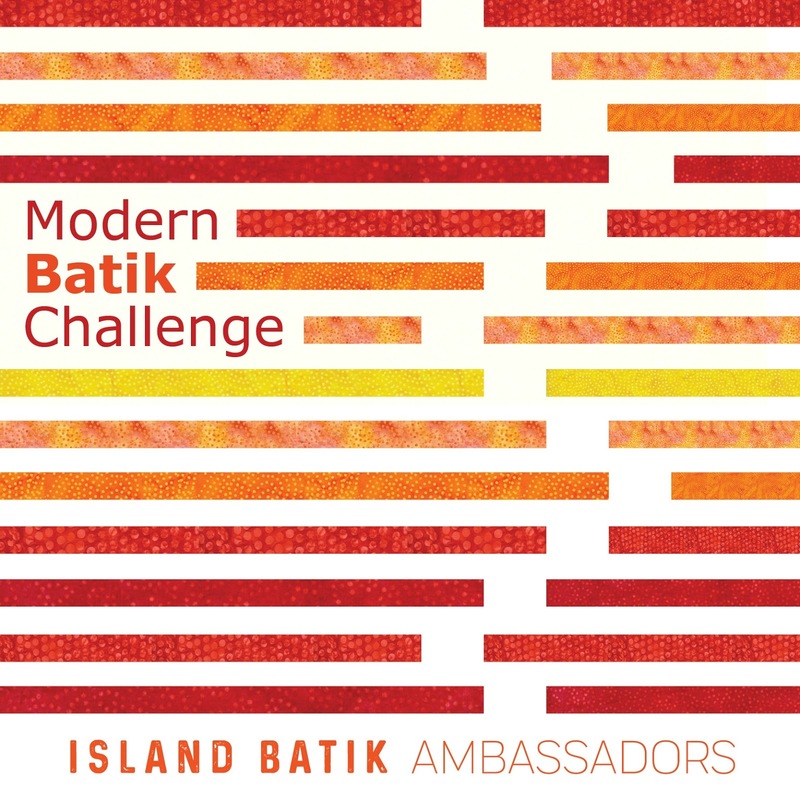 It's been a little while since I had an Island Batik giveaway and now is the perfect time! We'll be getting our next Ambassador goodie boxes in July or early August, and I've already set aside the fabrics I'll be using for those projects so I have plenty of fabrics to share! I sorted through my Island Batik bins (I keep my Island Batik fabrics separated out from everything else!) and found a whole pile of fabrics to share. I think this is enough fabrics for more than one giveaway given the size of envelopes that I have! I will stuff these envelopes full of fabric, and send them off to (at least!) two winners. This giveaway will close on Monday, July 2nd. 1. For everyone: Tell me your favorite scrap busting project! Is it potholders? 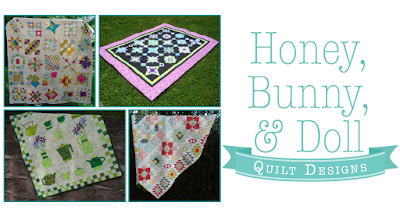 Crumb quilts? Paper piecing? 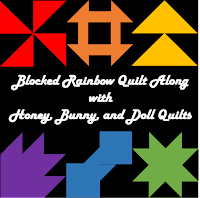 As a bit of a preview, our July theme is secondary designs, so I'll be working on a two block quilt baby quilt. 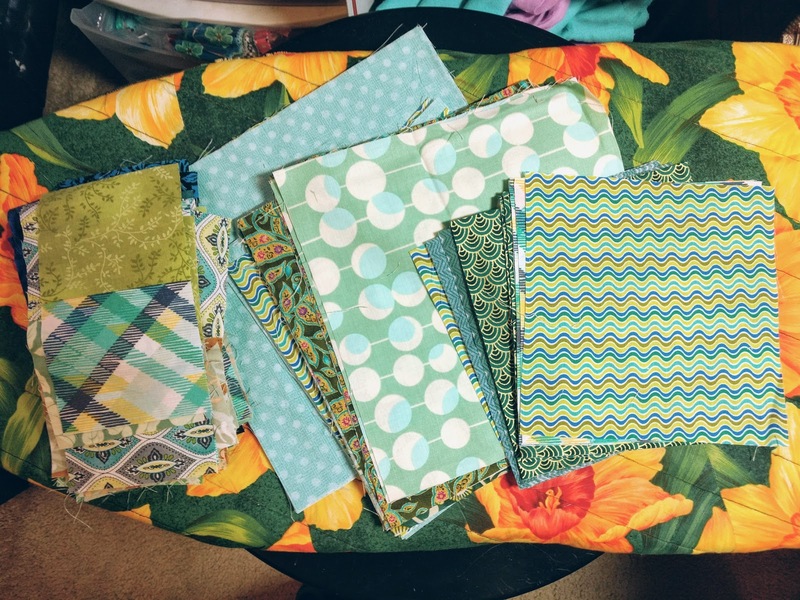 August is our blog hop month showing off the new fabrics that will be shipping to shops throughout the fall and I'll be working with the Jungle Cruise collection. I'll be using it in our Summer Patio pattern! Have a happy Wednesday! Don't forget to check out our $3 and $5 pattern sale on Etsy! Since I had not one, but two Saturdays last week because I took Friday off work, I was able to get two quilt tops done! One is an upcoming project for Moda Bake Shop that I've been sharing sneak peaks of on Instagram. But I also finished my Double Delight quilt top! (Pattern from Bonnie Hunter's free pattern tab!) I spent a long time trying to figure out what color to use as the setting triangles. I thought I had a few options in my stash, but I wasn't thrilled with any of them. One navy was too large a print, one burgundy was too red, one burgundy was too purple! In perusing the Fat Quarter Shop birthday week sales, I found a great chartreuse and cream print that is actually from the North Woods line by Kate Spain. Even though it's *technically* a Christmas print, it is the perfect color for this quilt! This photo was taken about 2/3rds of the way through sewing the rows together. Working on quilts that are on point always ends up with a big bulk of quilt to wrangle! 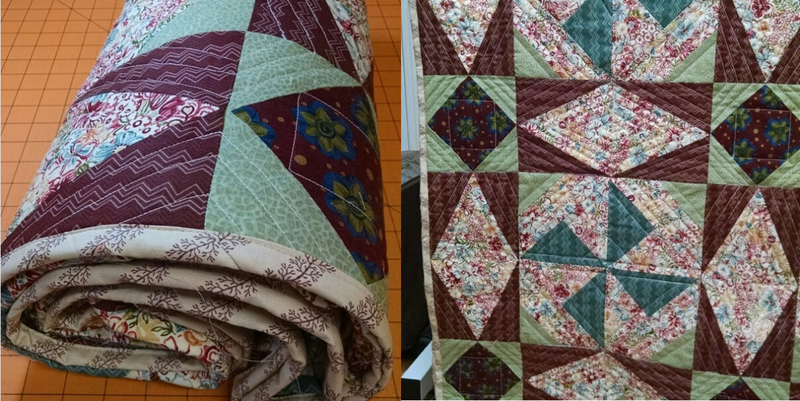 Even with straight set quilts of the same size, the on point quilts always seem to be more difficult to wrangle. 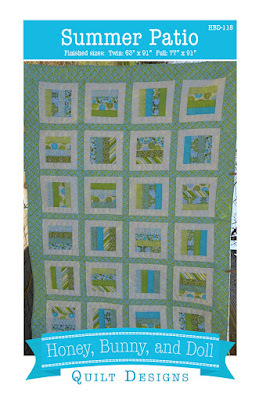 I think the green setting triangles really makes the rolling star blocks shine in the quilt! 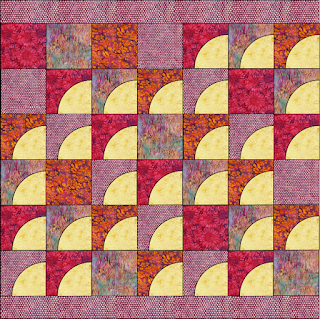 All of the different pinks blend together so well -- I was worried that the brighter pinks that I had to use towards the end of the process of making nine-patches would be too bright! I am not exaggerating when I say that I used ALL of my pink scraps! Now I'll need to decide if this quilt needs any borders. The quilt as is is approximately 64 by 76 so right now it would make a perfect throw, but with a little bit of border it would be a twin. Decisions, decisions! I hope you had a wonderful weekend! Thank you everyone for the kind words about my 30 Pearls quilt and the lovely birthday wishes! 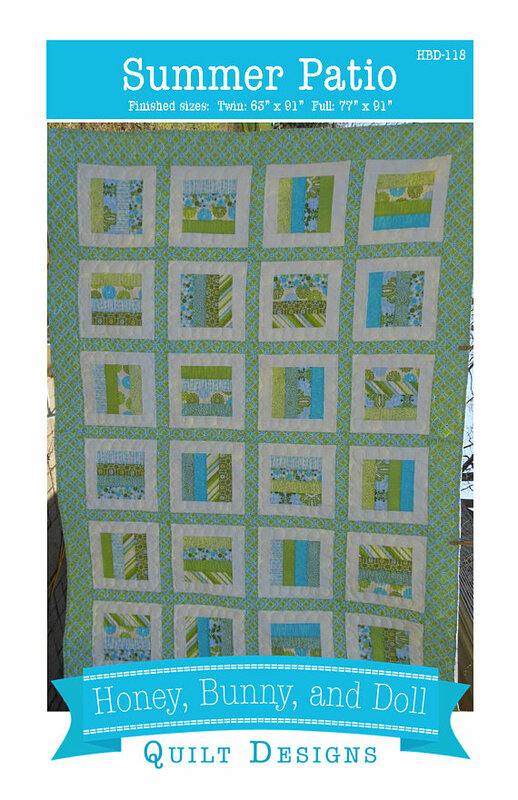 Sharing with Oh Scrap, Linky Tuesday Let's Bee Social, and Needle and Thread Thursday. PS. 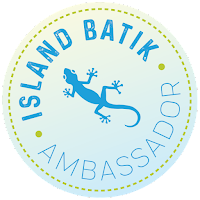 Don't forget to check out my Island Batik giveaway! I cleaned out my IB bins and pulled a gallon sized bag worth of scraps to pass along to some winners! Happy birthday to me and hip hip hooray for another finish! 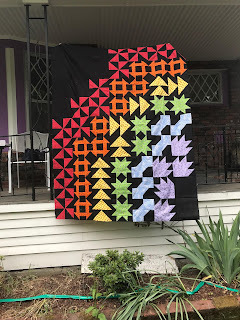 My modern-themed quilt for our June Island Batik Ambassador challenge is finished! You can see the first two posts on this quilt here and here. I finished the binding and trimmed all of the lose threads last night and am going to hang it up in my sewing room later today! 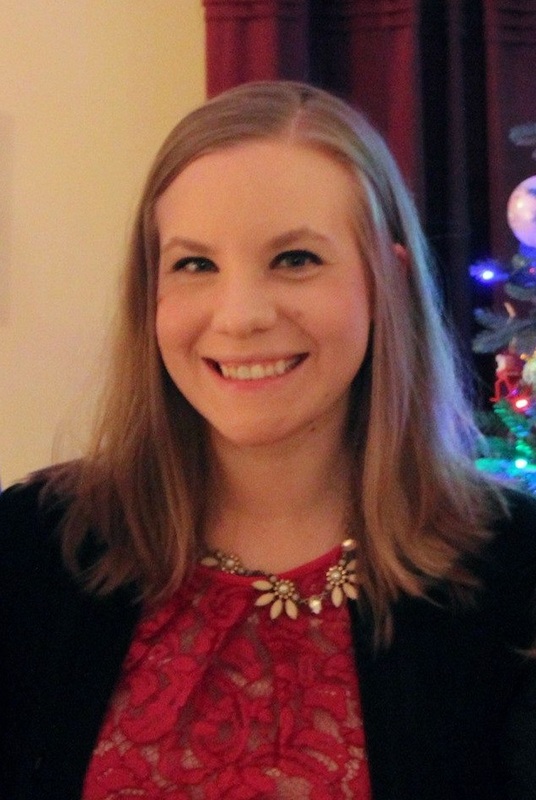 As I explained in my original post, there are 30 "pearls" to celebrate my 30th birthday (today! ), pearls are my birthstone, and pearl is a traditional 30th anniversary gift. I quilted free motion pebbles in each pearl with white Aurifil. In the backgrounds I used five different shades -- hot pink, red, dark coral, orange, and purple -- to quilt the different filler motifs. I used 56 different filler motifs inspired by Leah Day's quilting gallery! It required quite a bit of starting and stopping, which I don't normally like to do when I quilt, but it was 100% worthwhile for this quilt to be exactly as I had envisioned. The binding and hanging pocket are of a cream Island Batik print that is slightly darker than my pearls. I had originally pulled a purple fabric for the binding but I didn't have quite enough fabric for that. 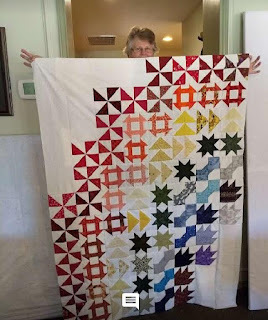 In the below picture, you can really make out some of the quilting with the orange thread! For the whole quilt, I used white thread in the bobbin so that I didn't have to change both the top thread and the bobbin every time I needed to switch between colors (which was a lot!). The texture on the backing is just so fun! 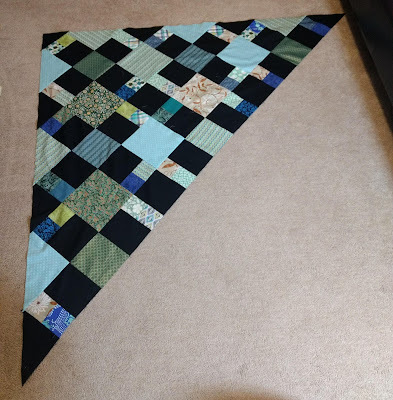 I managed to keep my pieced backing nearly perfectly square with the top, which is a miracle for me! I will try to post some close up pictures of some of my favorite quilted sections on Instagram over the weekend. 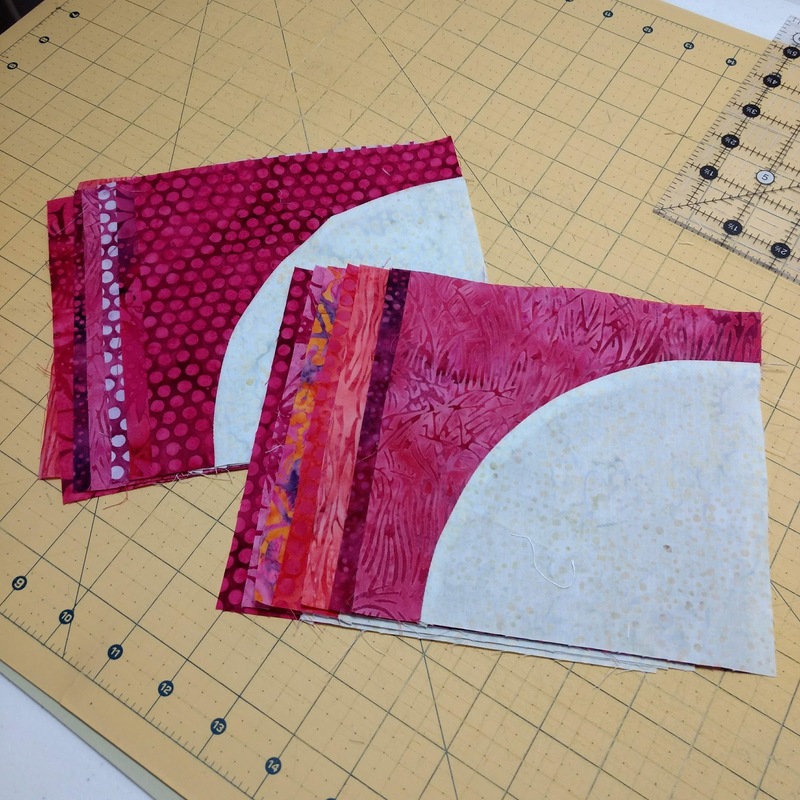 Using Leah Day's gallery as my inspiration was a great starting point however I had to think through how to quilt some of the designs in the arcs! Some were easier than others to "bend" into the arched spaces -- like the meandering type motifs and feather type motifs -- than others! There were a few that I decided would only work in the full squares rather than in the arches, which worked out well. This project is a rarity in that I both designed and made it for me for fun. I enjoy and love just about all of the quilting that I do but I don't often make something "just for me" and it was a nice change of pace to be completely selfish with this project and be finicky about every detail without worrying about writing a pattern to go along with it. As always, a big yippee hooray thank you to Island Batik for providing these fabrics for me each month to play with and to stretch my creativity! I love our modern challenge month as Amabassadors and this might be my favorite Ambassador project of all of the things I have made in the last 18 months! I'm now in a place where my fabric yardage and bundles are dwindling, and I have scads and scads of fabric that fall into the scraps-to-large-scraps category. Now that my Top Spin and On Ringo Lake quilts are finished, and my Double Delight and Donuts projects are ready to be put together into finished tops (with the help of a trip to the store! ), it's time to embark on a new scrappy project. Somewhat by serendipity, Melissa of Happy Quilting released her Drift Away pattern and I knew it was perfect for my green, teal, and blue fabrics that didn't get used in my Donuts quilt. Rather than use fat quarters, I used a variety of sizes of scraps, many of which were leftover chunks from backings, to cut the squares needed for this project. I also decided on using black for the background since I had a large chunk of it on hand. 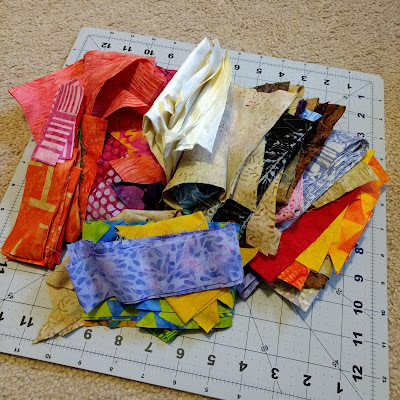 In this picture, the smallest size squares are already sewn into pairs, but I can still pick out lots of recognizable fabrics from older projects! The plaid on the left was the backing for Racing Rails, the teal dot was the backing for Sunset Gathering, the olive and aqua leaf is from my Midnight mystery quilt, and the squiggle is from Beau's Ties. One of the reasons I decided to go with black instead of a light solid is because the fabrics I used have both whites and off-whites in the prints. I managed to get a significant part of the first corner together rather quickly! I didn't lay out the entire quilt at once so I just started randomly pulling the medium and large sized focus squares from their piles. I have two different fabrics for the large setting triangles, so I am alternating them. So far I think my "place-the-squares-as-you-go" plan is going quite well. I only had to take out one or two seams where I sewed units upside down. Only a few rows to go until I'm halfway done with the quilt top! 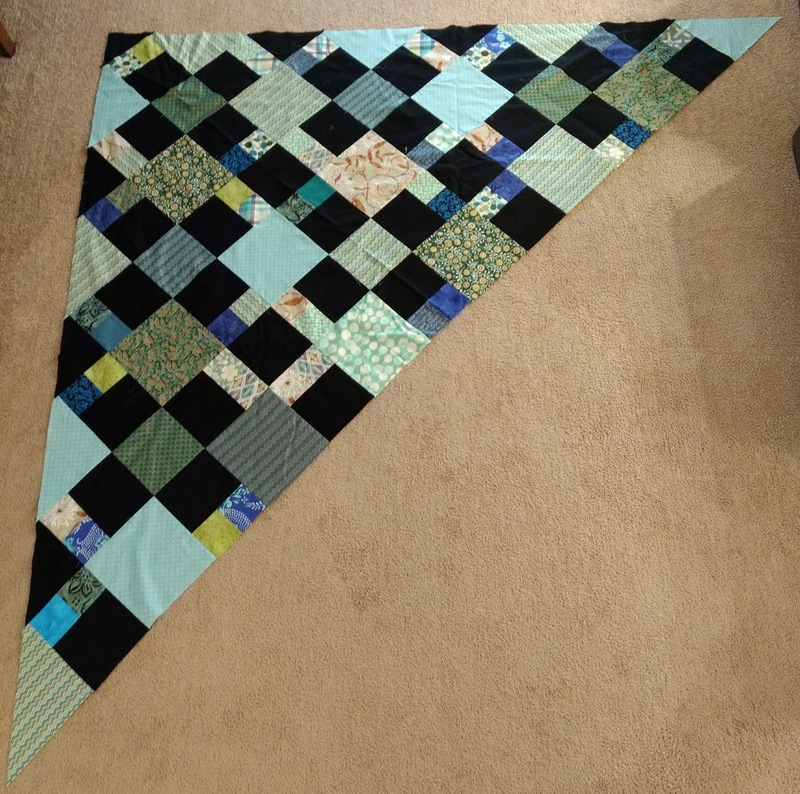 This quilt as designed ends up at 80" square -- I'm strongly considering adding a border on all four sides so that it would end up full/queen sized since I may give this as a gift. But those are things to decide another day! 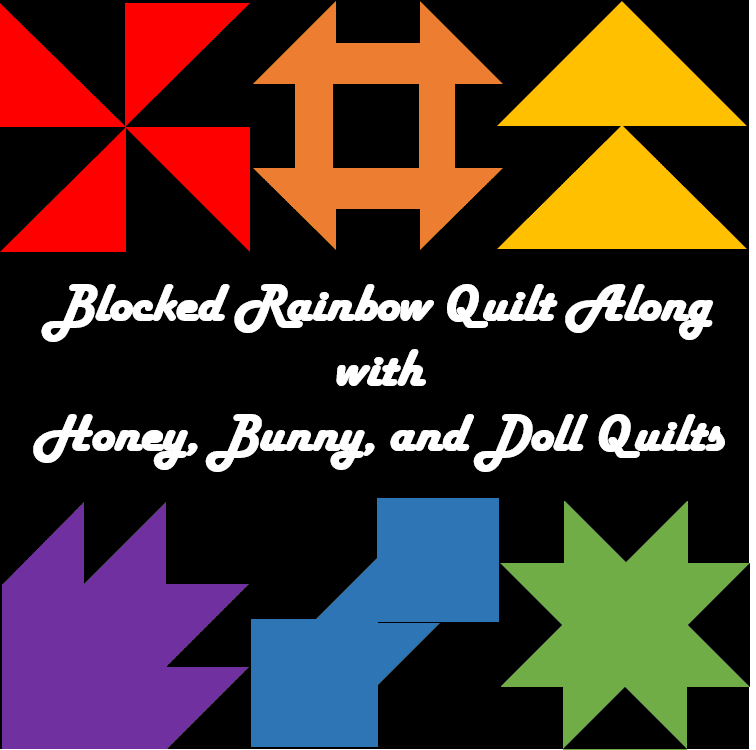 It's time to share the prizes for the Blocked Rainbow QAL! Thank you again to our sponsors and to the participants! I'm excited to share my finished quilt top for our June Island Batik Ambassador project! First and foremost, I love that my original vision worked out so well with these fabrics and was so simple to create! Even though I'm a nervous pinner for sewing curves, the blocks were quick and easy. 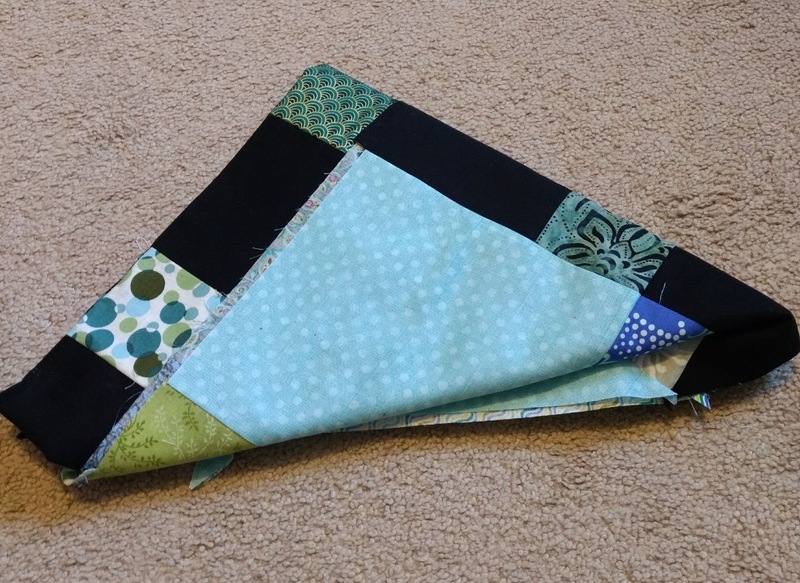 The one change from my original design is that I pieced the top and bottom sashing (which makes the quilt square rather than rectangular) instead of it being single pieces. This was out of necessity (since I was working with fat eighths!) and I think it looks great. And for comparison, here's the original design! Since I didn't want to buy something as a separate backing for this quilt (since it's going to be a wall hanging), I pulled some of my 5" Island Batik stash builder strips, one of the fat eighths that I didn't use in the quilt top, and a larger piece of green yardage (some of which I had used in my Blocked Rainbow quilt). The green piece of yardage wasn't quite big enough on its own for the backing, so I needed it to "grow" a little bit. I sewed the 5" strips end to end and then added four slice-and-insert strips to my green yardage, two going in each direction. I like the added interest on the back, even if I'll be the only one that knows it's there! Now to work in earnest on quilting the top! I'm planning to use white thread in the "pearls" and colored thread in the background. I actually have about a dozen different pink, purple, red, and orange-hued spools of Aurifil that I've been auditioning! I've also been studying Leah Day's quilting gallery for quilting ideas. Happy Friday and happy sewing! 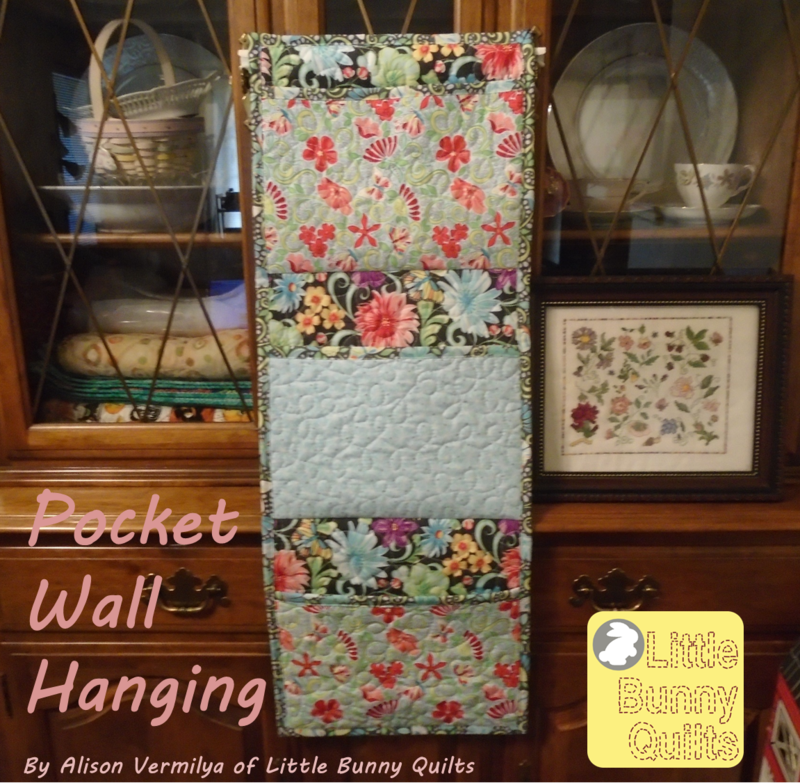 Sharing at Finished or not Friday and Linky Tuesday! 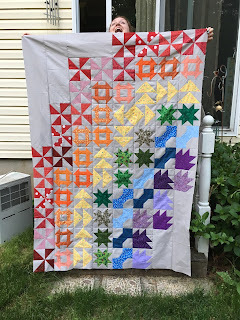 I'll fully admit that there were multiple times where I completely forgot that this quilt top was done and ready to quilt! I finished the top in July 2016 and this quilt was one I designed for a mystery quilt along I hosted. 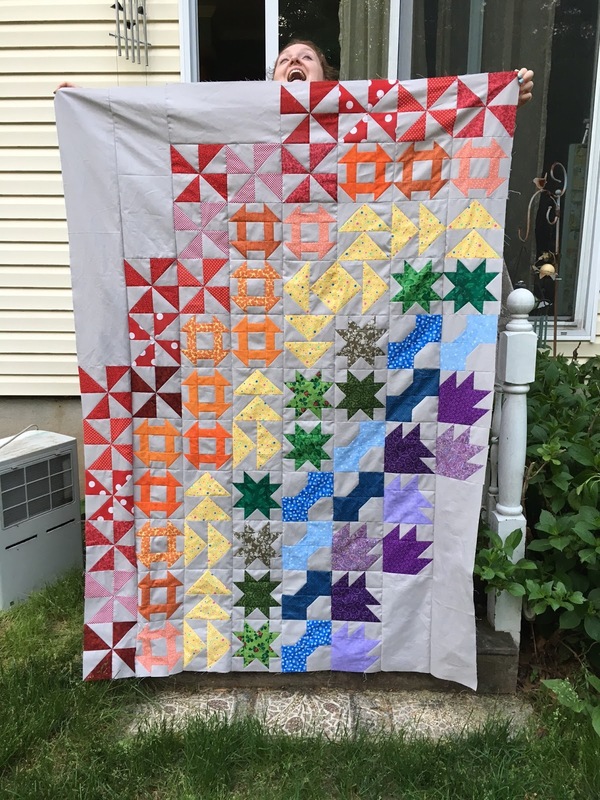 I actually bought the backing fabric for this quilt in July 2017 at the same time I bought the backing fabric for my Meadow quilt and my Green in Bloom quilt. This design was inspired by combining a traditional Storm at Sea block with pinwheels. I sent the quilt and backing home with my mom the last time she came to visit with the instructions to "do with it as she pleased." The reason this top sat for so long unquilted and unfinished is that I didn't know how to quilt it so it was probably the right decision to make someone else decide how to quilt it! The finished quilt is lovely! The quilting is all different sorts of echoing of the block shapes. The backing is an old Moda print from the Farmer's Market line. I love the diagonal vines -- it makes the binding look fantastic! This will likely become my new "mobile quilt" -- the quilt that I keep in the car for picnics and other activities! 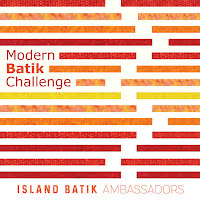 It's my favorite month for us Island Batik Ambassadors -- it's Modern month! I started plotting this project as soon as we got the schedule for this year! "Modern quilts are primarily functional and inspired by modern design. 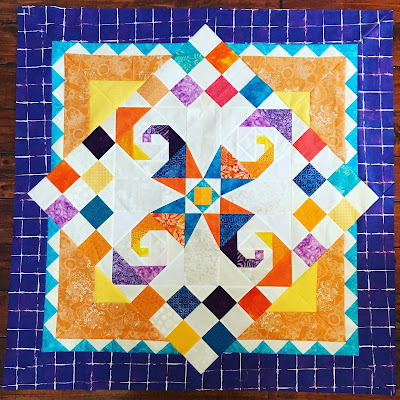 Modern quilters work in different styles and define modern quilting in different ways, but several characteristics often appear which may help identify a modern quilt. These include, but are not limited to: the use of bold colors and prints, high contrast and graphic areas of solid color, improvisational piecing, minimalism, expansive negative space, and alternate grid work." 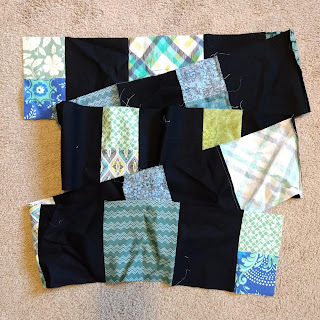 Last year I designed and made my Ombre Everest mini quilt which focused on improvisational piecing but also included alternate grid work. 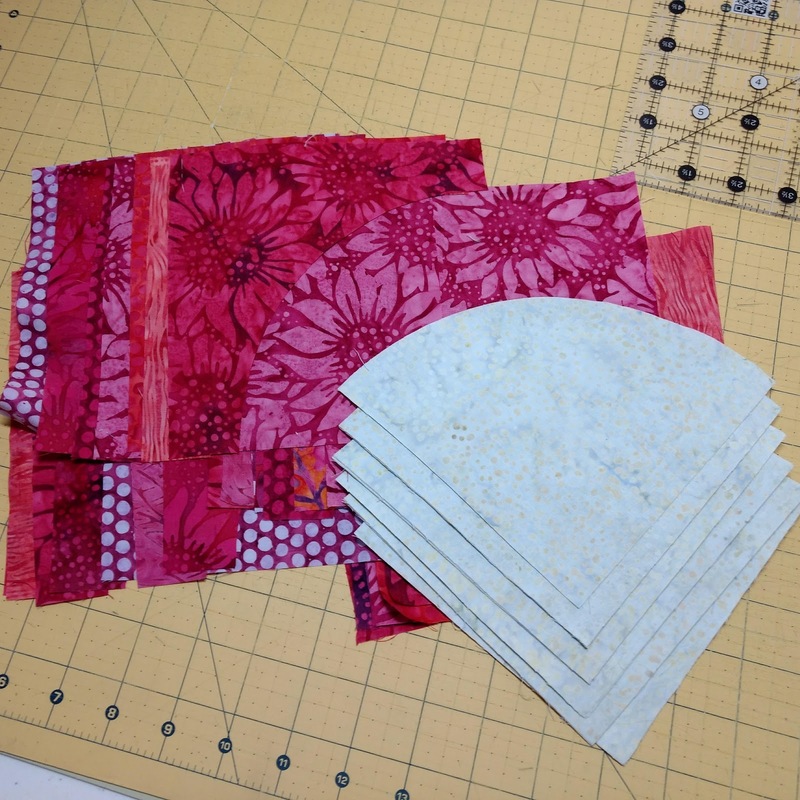 This year, I decided I wanted to use the pink fabrics from my Sunflower Serenade bundle (below) combined with cream for a very bold mini quilt. This "30 Pearls" design is inspired by the fact that pearl is the birthstone for June and a traditional 30th anniversary gift, in honor of my upcoming 30th birthday. The simple drunkard's path block "pearls" are scattered throughout the grid semi-randomly with lots of negative space for me to free motion quilt. I'm done with the cutting for the blocks and have sewn the first two rows of drunkard's path blocks. Next week I'm hoping to have a finished top to show off! I'm already thinking about the quilting for this one -- I think the white areas should be filled with pebbles (obviously!) and then I'll use a few different fillers for the pink fabrics. What do you think? Don't forget to check out what my fellow ambassadors have been working on by checking out the Island Batik Facebook page! Sharing at Finished or not Friday! Karen created the Storm at Sea center, Chelsea added the checkerboard corners, and Audrey added the striped corner sections. I decided that I wanted to add a border around what Audrey added instead of another set of corner sections to turn the quilt top on point. 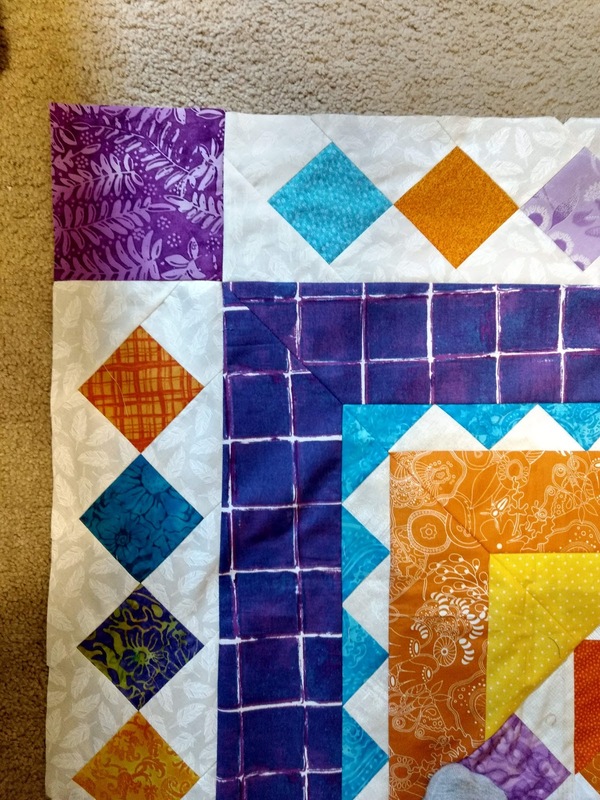 I settled on adding a diamond chain border around the quilt, with the same sized colored squares that Chelsea used in her checkerboard sections. I found a great cream print with white feathers to use as my background at my LQS while my mom was in town visiting. Getting the side sections together was very quick and I was able to cut each section to about 5.5 inches wide. I used one of the purple fabrics for squares in the corners. Here's a close up I used as a teaser on Instagram, which shows the low volume feather print quite well! Now this top is on its way to Stephanie to work on and I'll be receiving Stephanie's quilt for our last round of quilts this year! 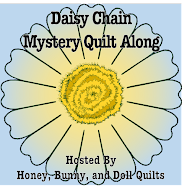 My quilt (or rather, my rows) will be coming back to me sometime in July! Sharing at Needle and Thread Thursday and Oh Scrap!